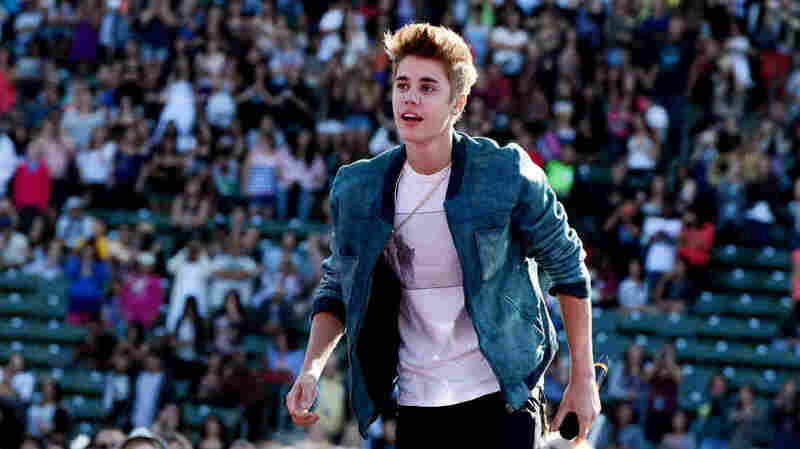 Why Justin Bieber Didn't Really Sell 40,000 Concert Tickets In 30 Seconds : The Record Or: Why Justin Bieber didn't really sell 40,000 tickets in 30 seconds. This weekend, as Billboard has reported, tickets for Justin Bieber's tour of the United States and Canada sold out in an hour. Not just one venue. The whole tour. All of the tickets. Completely. Except, not completely. In today's ticket market, selling out a show, or a tour, doesn't mean what we expect it means. There are a number of reasons, and they can get complicated. Robots are involved. And superfans. And credit card companies. To help untangle exactly how 48 shows of tickets could vanish in 60 minutes, All Things Considered called Gary Bongiovanni, the editor in chief of Pollstar, a magazine that covers the concert touring industry. Let's take as an example one venue, Madison Square Garden, which, as Billboard also reported, sold out its run of Bieber tickets in 30 SECONDS. MSG can accommodate 20,000 fans at concerts and Bieber is playing two dates (Nov. 28 and 29), which suggests that more than 1,000 tickets disappeared every second after the starting bell rang. Robert Siegel asked Bongiovanni how this could possibly happen. He says there are a couple of big reasons. Reason No. 1: It didn't really. "A lot of those tickets were already sold in the days leading up to that one public onsale," Bongiovanni says. "There was probably an American Express presale. Certainly the Justin Bieber fan club had a presale. And then there are a fair number of tickets that get held back for the record company, media and so on. ... It wouldn't surprise me if more than half of them were already accounted for before the public onsale." A few years ago, an investigative team in Nashville unearthed the "holds" list for a Taylor Swift show at the Sommet Center (now known as the Bridgestone Arena), a venue that held 13,330 fans. After Swift's fan club, management, agents, record label and opening acts got ticket allotments; after a radio-sponsored presale; and after, yes, American Express card members had access to a presale, only 1,591 tickets were actually available to the public. Reason No. 2: Scalpers are out there, and they're better at buying the remaining tickets than you are. "You also have to remember," Bongiovanni says, "that the secondary market, the ticket brokers, are actively trying to get as many of those good seats as they can, and they're professionals. That's how they make their living. There are artists — I don't think Justin Bieber is necessarily one of them — who will divert directly some of their inventory of tickets to the secondary market and make some of that money themselves." How are these professionals able to get in line in front of everyday fans? They've got banks of computers with programs called "bots" that are set up to maneuver around the safeguards (like CAPTCHA logins) set up by ticket sellers, and they can tie up a huge portion of the available ticket stock within seconds, then cherry pick the best seats available. This is not to say that the secondary market is a surefire moneymaker. Just because a broker on the secondary market can get his hands on hundreds of tickets doesn't mean it's a good idea. "It's not a science. It's really a kind of voodoo art in terms of ticket demand," Bongiovanni says. In this way, as Siegel says, a pop concert can be kind of like an IPO: venues, artists and ticket brokers (both primary and secondary market) place bets on whether the right number of tickets are on sale at the right price. If they bet wrong, they can lose a bunch of money. "Sometimes, you get a Facebook," Bongiovanni says, referring to the social media company's disappointing stock sales. That's not likely with Bieber's shows. There are currently more than 2,000 tickets for sale on StubHub for his first Madison Square Garden date, on Nov. 28. The face value of the cheapest ticket is $49.50. Tickets on StubHub start at $122 and top out at $4,500.